Can’t get enough of our practical tips to prevent your next plumbing leak in Knoxville? If not, then you are in luck! We have a few more tips that you can start implementing today (or in your very near future) to prevent extra costs from a potential plumbing leak in Knoxville. Whereas some of our other tips were to prevent pipes from bursting, to keep your eyes open for potential leaks, and to understand that everything needs replacing, this is more about things that can be replaced, specifically. Look for leaks around the place where your sink, fixture, or toilet actually connects to the wall. This is often referred to as a trap leak. Find out just where your leak is located. If it is at the back of the wall, you may have to disassemble the drain work to get to the plumbing leak. Or, you might want to see if you can tighten the drain work with your hands, or possibly a bit with a wrench. If your plumbing leak has not stopped after this, you should call a professional. On a regular basis, you should do your best to replace washer and o-rings. Changing these things on a regular basis is simple and fast. You should also do your best to replace gaskets if you see water dripping from your faucet on a regular basis and you have not let it drip, chances are you might need the gasket replaced. 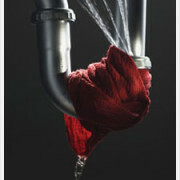 There is one last thing that you can do to help prevent your next plumbing leak in Knoxville. Look on your spigot to see in a frost-free hose bib has been installed. If not, then you may want to consider installing one. If your foundation is cement and your pipe runs through it, this is especially the case. In very cold weather, you can use a hose bib to shut off the water that is closest to the inside of your house, thereby making it a whole lot less likely that your plumbing leak will be caused by busted pipes. Plumbing Tips to Prevent Your Next Plumbing Leak (Part 1) Hire Any Knoxville Plumber… Even if it’s not US!